with the hope of producing synthetic materials. 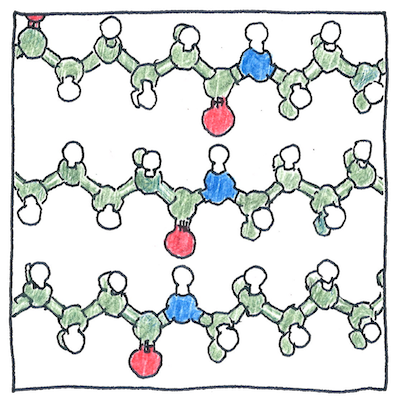 to the first synthetic rubber, Neoprene. condensation polymers such as polyesters and polyamides. with the hope of producing a synthetic silk. which became known as Nylon. and guitar strings were made of catgut. came to be known as nylons. to make parachutes for the war effort. Carothers evaluated over eighty polyamides before chosing nylon 6-6, so named because diamine and diacid each contribute 6 carbons to the polymer chain. DuPont chose not to register “Nylon” as a trademark. The names in the first list above are natural polymers, in the second, commercial, and, in the third, names for imaginary polymers that I invented.